Music has always been considered to be an extremely useful tool for building communication and language skills in a child or toddler. So today, we are going to take a look at the top 10 nursery rhymes that are perfect for helping a child learn the language in a fun yet efficient way. Read on to find out more. Row Row Row Your Boat is a true classic when it comes to discuss songs and rhymes for toddlers. The words, rhythm and tune are quite easy to comprehend for a child, making it a popular choice among parents. We all know Humpty Dumpty’s tale of falling off the wall. This popular children’s rhyme, historically based on the English civil war, is a masterpiece from Lewis Carroll, author of Alice in Wonderland. The large egg and all the king’s men are quite popular among kids and parents alike. There is not one adult who has not sung ring a ring a roses as a kid in kindergarten. This popular children’s rhyme is the perfect playtime song for toddlers, as it promotes language development through singing, as well as physical activity with the dancing and hand holding. The Wheels on the Bus can be found on every playgroup’s song and rhyme list. This rhyme or song promotes physical activity among kids, who can quite easily grasp the movements and actions of the song. It also paves the way for kids to grow their imagination by adding more characters to the song. Almost every parent sings twinkle twinkle little star to their children from the time they are in the crib. It is basically a rhyme or song for children where parents make shapes with their hands while singing, which helps the child to visualise and imagine these shapes, which in turn promotes brain growth. Incy wincy spider, a classic children’s rhyme, is perhaps another popular choice among parents. Singing this rhyme as a song promotes speech development among children, which is the whole point of nursery rhymes – learning words and framing them at the same time. 5 Little Monkeys Jumping on the Bed is a counting rhyme or song in nature, which parents and children can sing while the child jumps up and down on the bed. When singing this rhyme, a child can have fun while jumping as well as learn to count in a fun way. 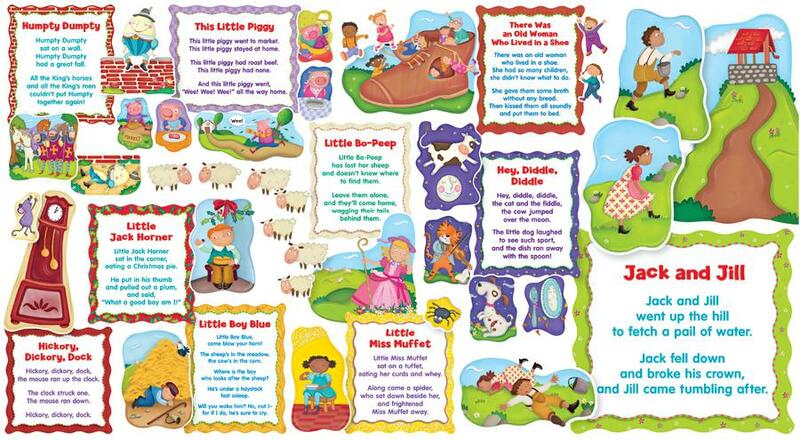 Old MacDonald had a farm is a popular children’s rhyme, not just because it is fun to sing, but because while singing this rhyme, a child can learn about a variety of animals and the sounds they make in each paragraph. Being another counting sung, 5 Little Ducks Went Swimming One Day is yet another popular choice among kids and parents alike. Pre-school children can greatly benefit from the lyrics of this rhyme, as they learn about numbers and try to grasp what subtraction is. If you are thinking of a knee bobbing song or rhyme to sing to your child, then This is the way the lady rides is a perfect choice. Children love to be bounced on their parents’ knees, so when you sing this song, not only do you provide a fun activity for them, you also promote the growth of communication skill.